You won’t normally catch me watching UFC fight night, but the latest match between Khabib Nurmagomedov and Conor McGregor got quite interesting to say the least. Nurmagomedov dominated McGregor during the fight itself, but what happened afterwards is what most people are talking about instead, effectively overshadowing Nurmagomedov’s win. Immediately post-match, a brawl occurred, causing a huge commotion and getting multiple people from both teams involved, as well as hordes of police officers, and even some spectators. So now that we know the context of the issues at hand here, here is a basic run-down of what happened: Nurmagomedov won the much-anticipated fight after months of tension had been building between he and McGregor, which eventually resulted in fans from opposing teams quarreling with one another as well. Per Joe Rogan, Dillon Danis, a McGregor teammate, was “insulting Khabib, saying something and provoking him” and Nurmagomedov then launched himself into the crowd of people, and attempted to attack McGregor’s teammate, Dillon Danis, who had been bad-mouthing Nurmagomedov for some time alongside his protege, McGregor. In the heat of the aftermath, UFC president Dana White refused to publicly hand over the belt Nurmagomedov was owed for his victory, stating that McGregor fans would start throwing things into the octagon. Most people say it was a long time coming since McGregor had been throwing jabs at Nurmagomedov in the form of hateful words for a while, even slandering Islam – Nurmagomedov’s religion which he has always claimed so proudly – in the process. In a sense, it seems like Nurmagomedov’s pot had been bubbling for a while, and even though he was victorious, the way this fight played out was the boiling point for him. And the worst part is, that’s what McGregor wanted. He wanted to provoke Nurmagomedov and tarnish his reputation, and Nurmagomedov fell for it when he could’ve just basked in his win. As this encounter between Nurmagomedov and Danis was ensuing, three of Nurmagomedov’s team members started scuffling with McGregor, who was still inside the cage. Eventually all the fighting was broken up, several arrests were made — although Khabib’s team was later released after McGregor refused to press charges…perhaps because newly emerging footage revealed it was actually McGregor who threw the first punches at them while still inside the octagon before they jumped over — and Nurmagomedov still didn’t have his rightfully earned trophy. UFC was threatening to penalize him by stripping him of his win all-together for being the perceived source of all the brawling. Nurmagomedov’s monies were also withheld, while McGregor was paid. But what about McGregor? Yes, both parties were definitely in the wrong, and once again, Nurmagomedov could have just taken his win and “been the bigger person” by letting McGregor’s comments subside. But that’s easier said than done when the jabs get rather personal, as McGregor’s did. Nurmagomedov has claimed that McGregor has insulted his father, his religion, and his nation over the past few months. He called Nurmagomedov a “smelly Dagestani rat” and called his manager a “f***ing snitch, terrorist rat”, among a few other comments. 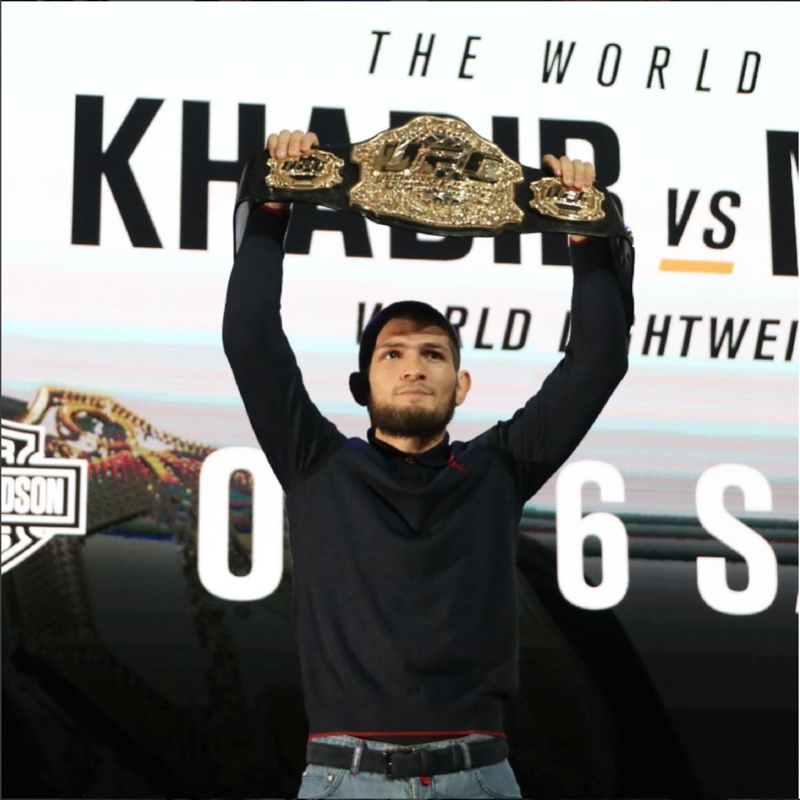 He called Nurmagomedov a “backwards c*nt” for not drinking and mocked him for not drinking and practicing Islam, asking him repeatedly why he didn’t drink after offering him alcohol. I don’t want to assume anything, but to me it’s pretty obvious that McGregor isn’t afraid to be frank about his racist thoughts. In my opinion, that should be just as punishable as starting a brawl like this. Let’s also not forget that back in April, McGregor and his entourage attacked Nurmagomedov’s bus in Brooklyn, almost blinding another fighter and ending his career, and causing others to be medically unfit to fight their card later on. McGregor was not stripped of belts, titles, or suspended from the sport after that. McGregor’s history of problematic behavior is long. He’s thrown water bottles at press conferences, taken belts from opponents, and even assaulted Nurmagomedov outside of the ring before the fight at a weigh-in, thumping Nurmagomedov’s arm, and then trying to kick him. McGregor has a long history of being racist towards his opponents. He called Mayweather’s bodyguards “monkeys” and told Mayweather to dance with for him. He threatened to colonize Jose Aldo’s favela and murder and enslave its occupants. He tried physically attacking Nurmagomedov’s bus in April, along with 20 of his boys. But he also questioned how things were playing out for him and how people were reacting to it all: “I don’t understand why people are still talking about me jumping over the cage, what about what he did? My friends all know who I am. My father taught me about respect,” he stated at the press conference. I agree, and after the debacle that was Nurmagomedov versus McGregor’s UFC fight, that seems like a really good direction to go in. But is it too late now for him to try and accomplish that? Nurmagomedov won fair and square, but might lose his title entirely because of this ordeal. He may even face criminal charges and might have his visa revoked. No matter who you were rooting for during this fight, I think it’s safe to say that none of it was called for and shouldn’t have happened, but neither should McGregor’s comments been allowed. One’s religious beliefs are not a vessel to be used against one’s opponents. It’s about time that McGregor learns this, and it is the UFC’s responsibility to hold him accountable. Image courtesy of Khabib Nurmagomedov’s Instagram page.